You can therefore imagine my excitement when I was contacted by Neil Mullineux, on behalf of Monty and Warwick Burton, asking if I would consider reproducing the complete book on the web site as a tribute to them. So eagerly did I reply that my response must have singed the Internet highways! Jubilee Class 5690 Leander BR No.45690 train, Built at Crewe in March 1936 passes through Marple 30 May 2015. By Arthur Procter. In compiling the book for the Internet the text and pictures of the original have been faithfully reproduced; however it has also been treated as a new edition - the first web edition! Unconstrained by normal layout problems when publishing a book, we have been able to enhance it with extra photographs taken from the author's book 'Marple Rail Trails' and also, when republished on this new site, the Marple Website's Virtual History Tour, along with other minor improvements and corrections. Another unique addition is a 2002 postscript written by Monty Burton with extra photographs and his thoughts at the time. A further enhancement is also proposed: this is a summary by Neil Mullineux that will condense the book and the History of Marple's railways for the casual reader reluctant to tackle the full twelve chapters. Both of these will be available only on the Marple Website. Rose Hill Station Staff c. 1949 provided by Ray Noble. Obviously I'm extremely grateful to Warwick and Monty Burton, both for their original efforts in writing and publishing this excellent work and also for giving permission for it to be reproduced on-line. In addition, I was pleased that Monty responded to the suggestion that a final chapter should be prepared by writing the postscript that has been added to the site. 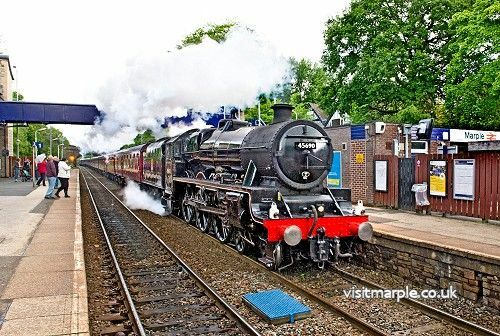 Thanks are due to Neil Mullineux for coordinating and arranging this tribute and for volunteering to write a summary more suitable for visitors with only a passing interest in the subject of Marple's railways. He should make a fine job of the task I had been avoiding for so long. Thanks also to David Bennett for his help and advice during the compilation and testing of these pages and Ray Noble for the great picture of his father and colleagues at Rose Hill Station above. Mark Whittaker - January 2002 / Updated January 2019.